La Princesa was set adrift by the nor'easter last week when the cable snapped on the tug boat towing her to New Jersey. 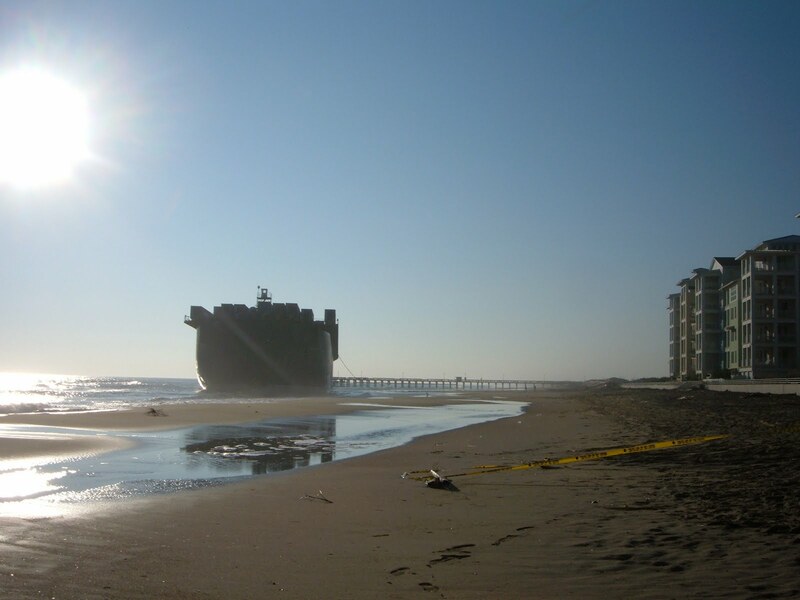 The 570-foot long unstaffed barge settled near the shore at Sandbridge Beach. This morning Elliot and I drove down to witness her return to the sea, but the high tide came and went. So her release is pending the evening high tide. This incident got me to thinking about life. How sometimes in the storms we're blown off course, stranded, unable to free ourselves of our predicament. It doesn't look like there is a way out. It is good to remember there is divine timing. The tides come and go. We must be patient while waiting for the waves to carry us back into the flow. This is the stuff that builds faith. In the big scheme of things, often these delays are by God design. After all, La Princesa, didn't crash into the Chesapeake Bay Bridge Tunnel as feared, but came to rest in a remote part of the beach in Sandbridge. Angels are all around us. And I believe the many prayers and loving protection of the angels helped her, as well as each of us, get through the storms and on to safer passage.